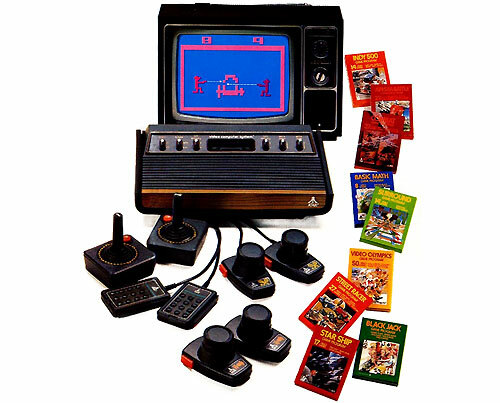 The Atari VCS (aka Atari 2600) saw a huge number of games released from its debut in 1977. These include a range of two-player competitive games such as Combat as well as many fun coin-op conversions such as Space Invaders. To play the games listed below on a modern PC you will need to use an Atari VCS Emulator and game files (aka ROM images) for each game. You will likely need to keep a separate record of what keys are needed as well as taking notes from each game's instruction manual. The Stella emulator is a great place to experiment with 4Noah utilities for reducing controls if needed as well as JoyToKey if you are using a joystick compatible controller. 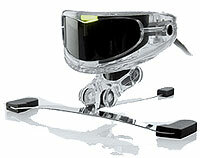 See the Accessible Gaming Utilities for direct links. You can discover many more games at AtariAge and Le Geek, the latter of which hosts the excellent shoot-em-up Robot Tank. See the 4Noah VCS page for a list of good games that can be adapted for one-switch play. Air-Sea Battle is a shooting gallery game for one or two players. It can be played with FIRE alone once started. All games have a 2 minutes and 16 seconds time limit. Simply shoot as many targets as you can to beat your own score or your opponents score. Difficulty "B" = larger bullets. I recommend trying the "Torpedo" game variations first, numbered 7 to 12. You may find selecting B/W mode improves visibility. Use "4Noah VCS" set to LEFT and RIGHT mode with auto-fire on. You are stuck in the middle with control only over aiming your fire. Alternatively, set the ship constantly spinning then hook up the main play switch to activate HYPERSPACE (down). This turns Asteroids into a game of chicken on games variations 1 to 9. Difficulty "B" = No UFOs. Variations "33" and "66" are the easiest. 10-pin Bowling for one or two players. This fun game can be played using a single switch if an enabler will assist with aiming shots. For instance, the helper could constantly move up and down, until the moment that the main player hits the fire button. Alternatively "4Noah VCS" allows for fuller one-switch control. Difficulty "B" = easier to roll strikes and spares. Canyon Bomber for one or two players. Atari's first one-switch game for a home console. Canyon Bomber is a coin-op conversion where one or two players must drop bombs to clear a canyon of rocks. Difficulty "B" allows a player to pull back their shot to quickly try again. Game variations 5 and 6 give players unlimited bombs - the first to score 1000 wins. Other variations set you a six miss limit. Outlaw cowboy shoot-em-up for one or two players. Playable using fire alone. Game variations 13 and 15 are recommended for one-player one-switch play. Game variations 3, 6, 8 and 11 are recommended for head-to-head battles between two one-switch outlaws. I recommend setting the difficulty to "A" for a much more enjoyable game. Here your shots will stop if you are shot. Fastest draw wins! Space Invaders Taito's 1978 classic brought home for the first time. Featuring a massive 112 game variations, there are many ways to play. One of the easier ways to play are of the "One player moves Other player fires" variety starting from 97. Using "4Noah VCS" it is possible to play with one-switch alone using the auto-fire mode. Hold down SELECT AND RESET (F1 and F2) to speed through the game variations. Ms. Pac-Man for one player only. Not really a very practical game for playing with one-button unless slowed down and using a 4Noah utility. However, it features the ability to choose how many ghosts you go up against, between one and four, making play much easier for those that can. Super Breakout (8 & 9), Defender (10 & 20), Missile Command (17 & 34), Pac-Man (3 & 7), Asteroids (33 & 66), Berzerk (12), Warlords (21, 22 & 23) and Yars Revenge (0 and 1). Games for use with paddles. With the Stella emulator these games can be played with any controller able to emulate the mouse or keyboard such as a head-tracker. Breakout, Canyon Bomber, Casino, Circus Atari, Demons to Diamonds, Night Driver, Steeplechase, Street Racer, Super Breakout, Video Olympics, Warlords. Atari Age: An absolutely superb resource of Atari information including ROMs. FlapPing: A tricky one-switch game of Joust mixed with Pong. Le Geek: A select range of Atari games including some Activision classics. Video Game Critic: An easy to browse list of Atari game reviews. Game Winners: Cheats for the Atari VCS to make play easier. Stella: The best Atari VCS emulator. Spotify: ATE Atari VCS years musical sound track.